Creation Textile was registered in the year 1998 with HMG/Nepal, Under Ministry of industrial Commerce and supply, Department of Cottage & small industries. The objectives of Creation Pashimina were to promote the export of Nepalese handicrafts, Pashmina textiles and thus help lift the economic condition of the craftsmen and ordinary workers as associated with Creation Pashmina. 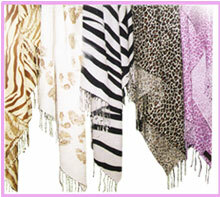 We Manufacture and Exports Pashmina Shawls, Scarves, Stoles, Throws, PASHMINA, Silk pashmina, Cashmere, 100% pashmina Shawl, beaded pashmina shawl, Plain Pashmina Shawl, Pashmina Muffler, Scarves, Hats from Nepal.